Type of Site: Mountain . . . . . . . . . . . Type of Flying: Thermal. 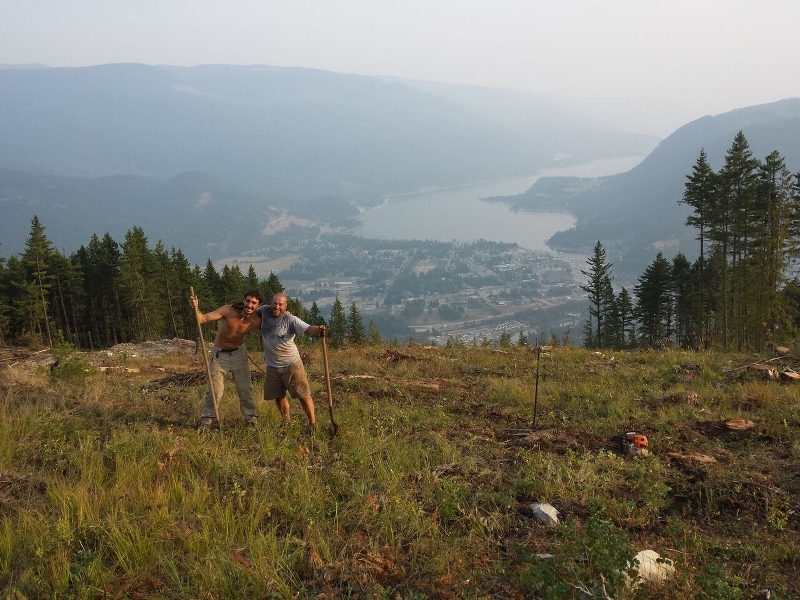 Location: Mountain is due Nth of Sicamous overlooking Shushwap Lake. - Okanagan Valley in South Central British Columbia, Canada. Mild conditions: Nov. Int. Moderate conditions: Nov. Int. Strong Conditions: Adv. a) Hang Gliding Ramp is an Excellent large, wide ramp (repaired in 2011) off the side of the road. Wire assist may be required with even moderate winds. b) Paragliding / SIV Launch 800 m to the east of the Hang Gliding Ramp. - turn right along the base of the mountain and take the first good road heading north up the mountain. Turn off onto the #300 Forestry Rd - about 5.8 km up the dirt road. Another ~ 1 Km in and you'll see the Paragliding launch and then 150 m on, the HG ramp immediately to your left. 15 minutes turnaround from LZ to launch on a very good 2WD road. The Hang Gliding set up area is on the road, so don't block traffic with vehicles. Our Hang Gliding Ramp is a popular scenic lookout point for the community. Times to Fly: all day. Excellent spring, early summer and fall site. Small, "cannon ball" thermals are close to the vertical south facing cliff face are fun and educational: learn to do 180° turns in lift to gain altitude. The west facing ridge around the point has very pleasant thermals overlooking the lake with an easy glide back downwind to the Old Town Beach LZ. Description of LZ: Varies - check with locals. Do Not Land in crops. Immediately east of the main Hyw #1 Intersection with Hwy #97 turn north onto Hillier Road then turn left (west) at the base of the mountain onto Old Town Road and drive to the end. Photo is taken looking south towards the grassy breakdown area. The windsock is to the left of the boat. 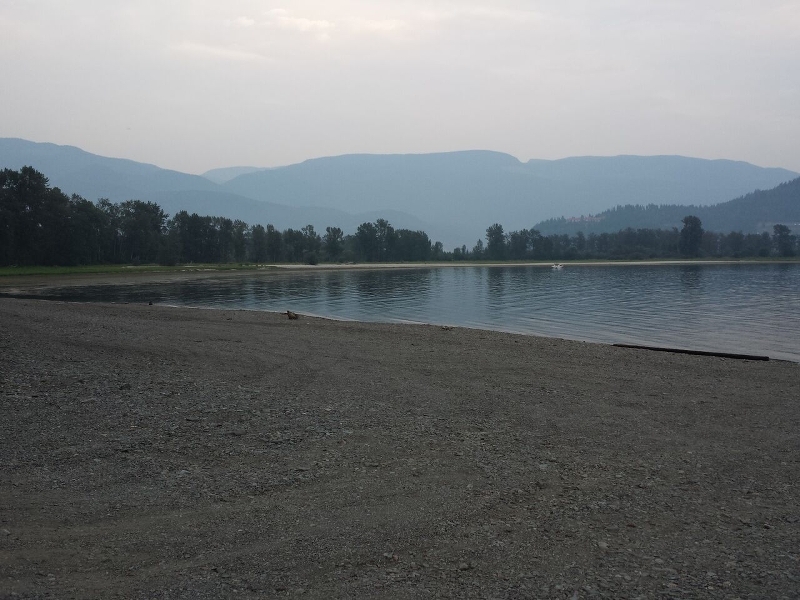 2.The northern half of Sicamous Beach in front Sicamous Sands RV Country Club. Access via Silver Sands Road. 3. A large field east of the built up area of town on the east side of Sherlock Rd, south of Highway #1. 4. There are bomb out LZ's below and to the east of launch. c) the old log sort yard just NE of the crop field, immediately south of the railway line. a) The Regional District has given us permission to land on the northern half of Sicamous Beach in front Sicamous Sands RV Country Club. This is the LZ used for events such as the Sicamous Hang Gliding ReUnion Fly-In. Access via Silver Sands Road. b) The Regional District has given PGers permission to land in the waterplay park just NW of the rail road overpass behind the public beach. This is a very tight LZ, surrounded by High Trees now. The ball park in town is now closed to landing. Then if you fast forward to 7:30 you get a good view of the pretty Sicamous Sands LZ and approach. View from the South Facing Sicamous HG Ramp, looking towards the west facing Mara Launch over Mara Lake to the south. The Sicamous Sands Beach LZ is the grassy area and sandy beach seen at the right corner of the Hang Glider's Control Bar. At 5:20 you get a good but distant view of the Old Town Beach (SIV LZ) with the proposed PG / SIV launch site above it. - the east bay shoreline's water is knee deep for 100m or more. Other Information: Annual fly-in on the second weekend of September. Class E Controlled Airspace above 8000' ASL. Re-set your altimeter to the accurate launch altitude before flying. Site Record(s):[/b1 Gain: 11,000' (Max) Duration: . . . . . Open Distance: . . . . .